How to find plasma display panel (PDP) voltage settings - ZBias, Va, Vs, V set_up etc. Homebrew technicians and even professional technicians with lots of experience with CRT TVs, but not familiar with plasma TVs often ask me how to find the ZBias or Va or Vs voltage for the plasma they are working on. It usually happens when they send us a Z sustain board or Y sustain board for service / exchange and we send it back with a note remidning them to adjust ZBias after the board arrives. Everything in a plasma TV revolves around the display and plasma displays, much like computer processors, may come in with slightly different parameters, even though they'd still carry the same panel information. So all plasma TVs , in fact all plasma panels, would have a sticker somewhere on the back of the panel , usually in the upper right corner, which indicates the data for this particular panel. This morning I got a call and the person on the other end said: "We received one of your Y-sustain boards and man, (chuckles) it ain't gonna work this way!". Then he explained that they received a board serviced from us - it was a Y sustain 6871QYH039A or similar - and when they powered the TV it had popped out as those sustain boards usually do. He said he then looked at the board and he has never seen such a bad job in his 30 years of electronics servicing experience. He has, in fact, brought in other technicians and, I quote, "they had all laughed". Now, a little note from my end before I present the question I am actually writing this about. On my end I know the board that he received was most certainly tested before it was sent out. It was not extensively tested and I would agree that the repair technique used is not one recommended in official LG service bulletines. After all, there is only so much you get for your money. I do claim, however, that the board was functional and that the way it was made functional is reliable enough. I have several arguments for that claim, starting with the fact that tens of other customers use such boards, even though they are not serviced by the book. It is very much like the way my close buddy the other day replaced the lower left arm of my Volvo without following the official dealership procedure for doing it. The car still drives great and I he saved me tons of money. I am aware he used a hammer to get somethign out when he could have used a machine, but I trust his experience and I believe I made a good deal by choosing him over Volvo dealership. Frankly, I have no idea what did the technicians laughed at. I am actually about to call back in a minute ( I was driving before ) and ask what was there to laugh at. They may want to chime in here. I myself avoid laughing at people with 30 years experience in anything. I just wonder how come they had to rely on my service at all. I sell the parts for the board and I make it clear everyone is welcome to try the repair themselves. Now to the point: bad feelings aside, let's try to analyze the situation. You do a remote service job, you test your product. Customer tells you it fails on furst use. Let's assume all he says is true and he's not trying to trick me. Let's face it, it is possible for that to happen. Unlikely, but possible. It may be due to cold solder on your end, due to malfunctioning component - be it replacement or another. It may also be due to improper installation. Customer, of course, would rule that out in the same fashion in which I'd rule out the possibility of a tested board to blow on its first use after the test, but the fact remains - it is possible. Sustain boards , in particular, produce sharp voltage changes resulting in all possible harmonics. Resonances are possible and it is essential that the board is well affixed to the body to avoid them. So it could have been anyone's fault. My question is - what would you do if you were the vendor? What would you do if you were the customer? 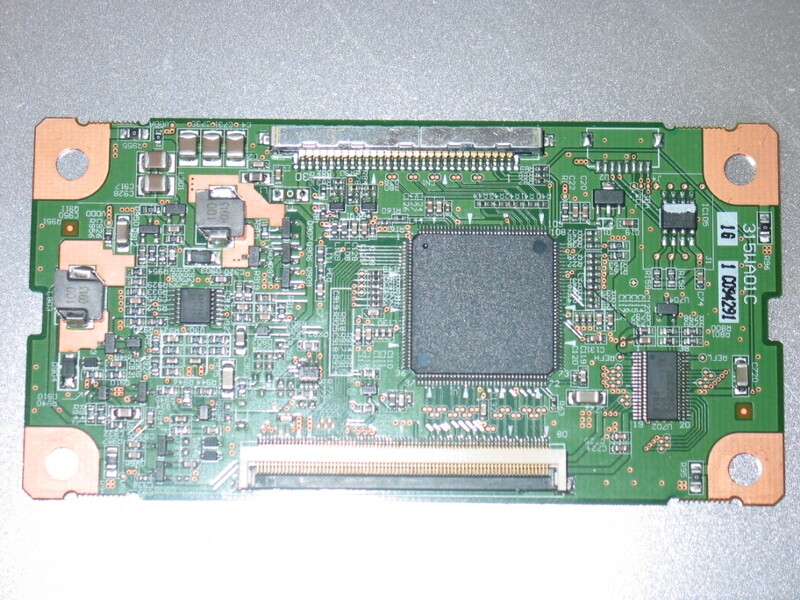 315WA01C is the T-Con board used in Dynex DX-L32-10A 32'' LCD TV introduced by BestBuy about a year ago. The mysterious thing about it is that a year after the TV reklease, Google can still find only 5 (five!) refernces to that board at all! And it's been that way for the past few months - I know because I've been looking for it. Oddly enough, one of the few links leads to a PartSearch actual product offerring , but not unexpectedly, their asking price is comparable with the price of a new TV of same or similar cheap brand. One thing that puzzles me is if it's the board that has gone bad or the LCD itself as some of my sources claim. It is hard to be sure, but I first determined that the LCD supply power is there on the T-Con output - 15V and 3.3V, which, even though not a guarantee, is a good sign as far as burned T-Con boards go. And then I played some with my fingers through the T-Con while TV was working and for a second I got - I swear - proper image in the middle of the screen! So I'm leaning towards the probability of the T-Con gone bad. Yet I still feel bad ponying up $75 just to try. Especially for a model that has been unofficially discontinued and apparently not supported. If I decide to try it I'll let you know. For the time being, just stay out of Dynex, all right? 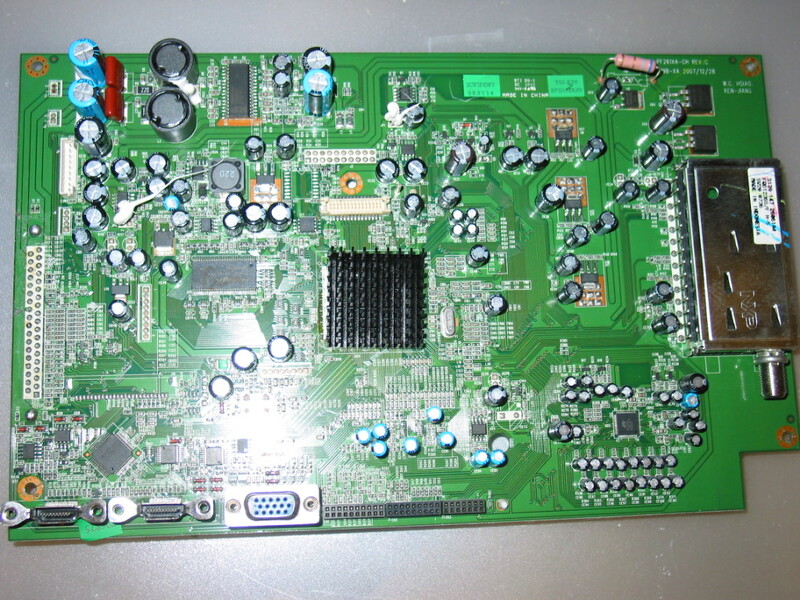 In March I blogged on the ability to interchange main board between Polaroid TDA-03211C and Polaroid TDX-03211C. A few days ago I had a customer bring in a Memorex MLT3221, which, deisgn wise, appeared the same as the above mentioned Polaroid models. It was apparently the same piece of equipment just branded to a different company. Even though it is the faulty power boards that those Polaroids are notorious for, the Memorex MLT3221 had an apparently good power board - first because it had all the produced voltages neatly printed on the board and second because they all checked. So apparently it was (again) the main board. 200-107-PF261XA-CH. Well, it turns out this boad is rare. Especially if you search for a board for Memorex. In fact, I did not find any availability for Memorex. However, I did find a board with the same tag available for Polaroid TDX-03211C. You guessed it, it worked. But wait, it's even more interesting! Suppose you do not find 200-107-PF261XA-CH for neither Polaroid nor Memorex. What do you do then, throw the TV out? Pay $150 for a main board for a 32'' TV when you can get a new one on Craigslist for $250 and at Walmart for $300? No, you can simply use 200-107-GT32XA-BH from Polaroid TDX03211C and therefore, because of my earlier post, you can also use 200-107-GT32XA-AH from Polaroid TDA03211C! There might be the minor issue of having to see "Polaroid" instead of "Memorex", but if you find the board at a good price that would hardly matter a lot, right? And finally, if you use Polaroid board in Memorex you will need a little extra work to extend the antenna cable connecting the board with the external antenna outlet. All in all, though, none of these is a deal breaker. I hope you can use that information and it can serve you well as it did serve me! I spent some time familiarizing myself with FLM-3232 power board R0804-0901 and as a result I now offer repair service for it. Apparently the board is prone to burning and unfortunately it's not just due to drying out filter capacitors - it involves active elements too. If you need yours repaired you can find the service here. UPDATE: I posted an article on how to test the board so that you do not send it for repair without having to.